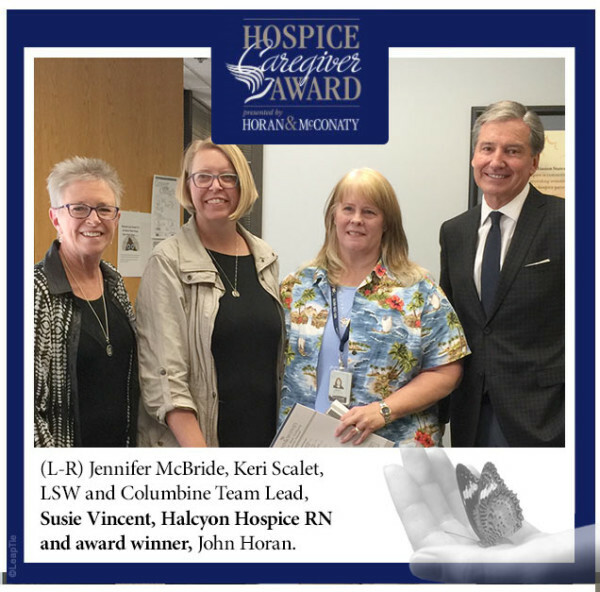 Susie Vincent is the winner of the Hospice Caregiver Award presented by Horan & McConaty. She was nominated by Jamie Weatherly. Susie Vincent represents the epitome of what any hospice RN should strive to be. She is a devoted hospice nurse of 6 years, expanding her career from the bedside to teaching other nurses how to care for someone when they are at the bedside. She gives her time and energy unselfishly to help all around her understand and experience what hospice care is meant to be. In addition to her work, her family, and her home life, Susie has taken the time to write her own book regarding her hospice experiences, her family dynamics in supporting and coping with their own loss and grieving process. From Hospital to Hospice: One Nurses Journey Towards Grace at the Bedside reflects just how much Susie supports and encourages others to understand the dying process. Susie is a Caregiver of a Lifetime.